Click the link in article below to access the printable registration form. 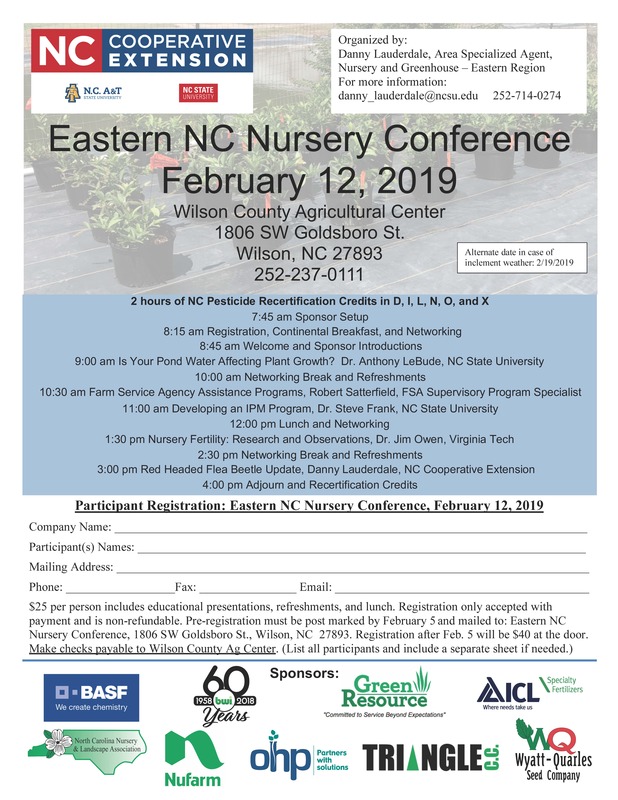 This educational conference will focus on commercial ornamental nursery production and will be held at the Wilson County Agricultural Center. Water, fertilization, pest management, and disaster assistance are the topics of focus. Pre-registration is preferred and is $25 if postmarked by Feb. 5, 2019. Registration after Feb. 5 will be $40 at the door. Contact Danny Lauderdale at 252-237-0113 or danny_lauderdale@ncsu.edu if you plan to register at the door. Print the conference registration flyer, which includes detailed agenda and sponsors, and follow instructions for registration. The agenda is also below. This conference is approved for 2 hours of Pesticide Recertification Credits in Categories D, I, L, N, O, and X. You must attend the entire conference for these.